You type a message and attach files as usual. Then click Secure Send. Try now: Click here to install the Encyro Outlook addin. (Re)start Outlook. 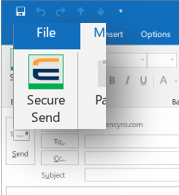 Compose and your message, attach files if needed, and click the Encyro Send Secure button. It is that easy! Compose message and attach files as usual. Then click Secure Send to send encrypted via Encyro. Received secure messages are automatically decrypted and displayed in Outlook, with secure files. 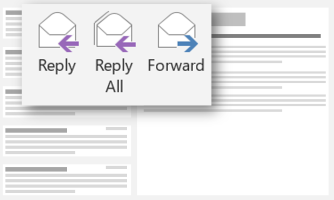 Usual reply, reply-all or forward buttons automatically send secure when responding to a secure message. Your usual email workflow in Outlook becomes secure with the new Secure Send button. Your familiar reply, reply-all, and forward buttons work securely with secure messages. Attach files like you do already (no special uploads or link insertions). They do not need to install the Encyro Outlook add-in, or create an account. They simply click a link sent to their email. No passphrases, keys, or certificates. Not on your PC with Outlook? You can access your sent and received messages or files on any Internet-connected computer or mobile device. Use any of your email addresses to send and receive secure messages. Only accounts you use with secure messages get associated with an Encyro account. Everything from our software design, data center operations, and emergency procedures is optimized for security. Helps you keep client data secure to comply with HIPAA, GDPR, Gramm Leach Bliley (GLB) Act, IRS Pub. 4557, PCI-DSS, SOX and other security and privacy regulations. Stop wasting valuable time taking printouts, preparing envelopes, and serving client requests for copies. Save time and money with Encyro. No more creating client accounts or shared folders, adding permissions, or sending special links to shared folders. Send direct to your client's email. No need to download, save and re-attach. 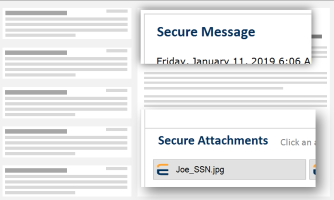 You can forward a secure message and select the attachments to include. It is delivered securely. We backup your data at multiple data centers separated by hundreds of miles within the United States, for extra reliability. 2. Then click the downloaded setup.exe file near the bottom of your browser to run it. 3. Restart Outlook. Start composing a new message and you will see the Encyro "Secure Send" button near the top left. You get rock solid security and direct secure-send from Outlook for free, along with all the benefits of Encyro Essential membership. 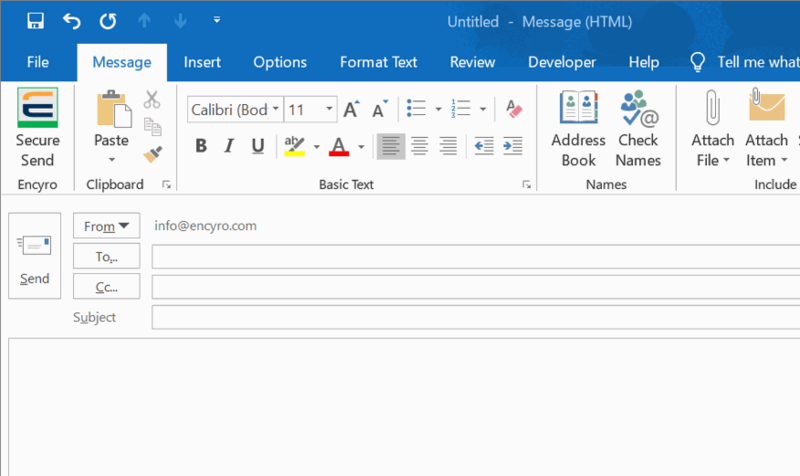 Encyro Pro additionally lets you read received messages automatically within Outlook. Your email signature and any logo images are preserved in secure messages sent from Outlook, and displayed to recipients just like usual. To schedule a demo or ask any additional questions: contact us anytime. For how-to articles and videos, visit our Help Center. Encyro makes it easy to protect client data in email messages and attachments, to help you comply with HIPAA, GLBA, GDPR, IRS Pub. 4557, PCI-DSS, SOX, and other standards. © 2019 Encyro, Inc. All rights reserved.